Scottish club Kelburne have signed Sri Lankan Shanuka Dulaj for their 2019 WDCU first division campaign. Shanuka (23) is an exciting talent who burst onto Sri Lanka's domestic scene in 2015/16 taking T20 figures of 5-22, before hitting his maiden first-class hundred (128) a month later. He has since played 23 first-class, 8 List A and 9 T20 matches. He continues to impress, particularly in red ball cricket where he averages 36.09 with a highest score of 181*. Shanuka has also spent the past two seasons abroad, playing in England (2017 - Austerlands) and Scotland (2018 - Arbroath United). In his opening stint, playing in the top tier of the strong Pennine Cricket League, he scored 548 runs at 34.25 and took 13 wickets at 34.85 with his left-arm spin. He then backed up with 447 runs at 31.92 and 12 wickets at 25.41 in the CSL Eastern Premiership last summer. 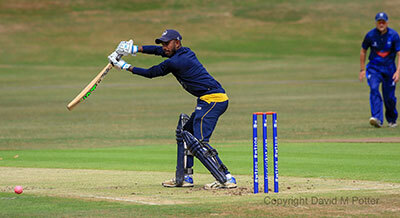 Kelburne moved very quickly to sign the Sri Lankan star following his success in Scotland last summer. Club Secretary, David Wright, stated the following: 'We are delighted to bring a player of Shanuka's calibre to Kelburne following his successful season in Scotland in 2018. The Club wishes to thank CricX for their advice and support in finding the right fit for both parties and bringing the deal to a swift conclusion. "The singing of Dulaj, a level 2 qualified coach, affirms the clubs commitment to both youth development and returning Kelburne to premier league cricket."